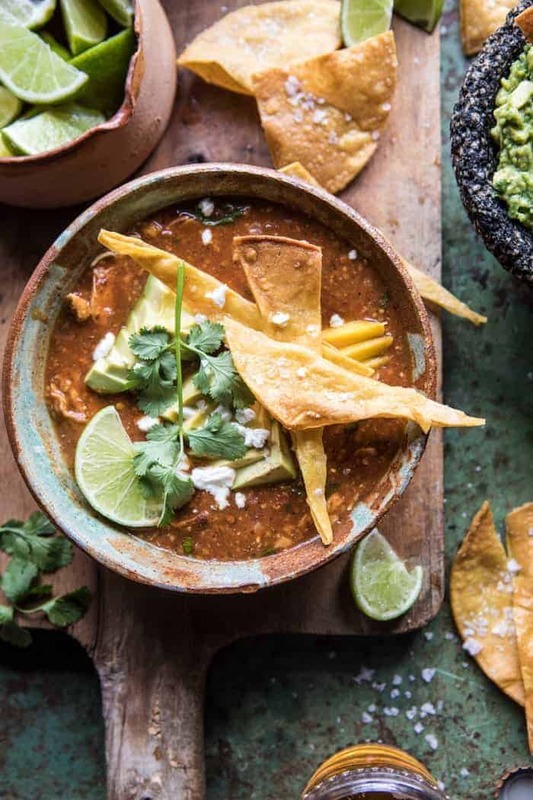 The day after Christmas…perfect day for a bowl of this Slow Cooker Chipotle Chicken Tamale Chili. And just like that it’s the day after Christmas. Hoping each and every one you had an amazing Christmas with your family. And for those of you who did not celebrate, I hope you had a relaxing day off! My family and I had one of the best Christmases yet. It finally snowed, really snowed! Which made for one of the best white Christmases ever. The day was filled with good food and even better company. I have so much to share, but I’m going to save all the details for another day, as I’m attempting to keep today’s post short and sweet in an effort to spend less time online, and more time with my family. Every year for New Years, my family and I have always made a Mexican feast. This is something my late Aunt Katie started and we’ve carried on the tradition. Back when my cousins and I were kids, we’d spend the week after Christmas at our cabin in Ripley, New York. My Aunt Katie always used to bring tons of fresh tamales for New Years Eve and it was something everyone looked forward to each year. Here’s the thing, I’ve attempted to make homemade tamales before, and well, I don’t really have a desire to do it again. They are a lot of work, like a lot. Too much for me, and especially when feeding over seventeen people. These days I stick to tamale inspired recipes (hello to this tamale pie), plenty of tacos (new recipe coming on Thursday! ), and bowls of guacamole. This year’s recipe is all about easy slow cooker tamale chili (with stove top and instant pot directions too). If you guys like tamales, and you like chicken tortilla soup, then this is your kind of a chili. It’s basically a cross between those two recipes and it is DELICIOUS. I used my favorite Mexican spices, some chipotle in adobo, and my homemade enchilada sauce (recipe in my cookbook) to flavor the chili. To make the chili thicker, creamier, and to give it that true tamale taste, I used Bob’s Red Mill Cornmeal. Guys, the cornmeal is what makes this chili. It adds that sweet corn flavor of Masa, which is used in traditional tamales. And then the toppings. 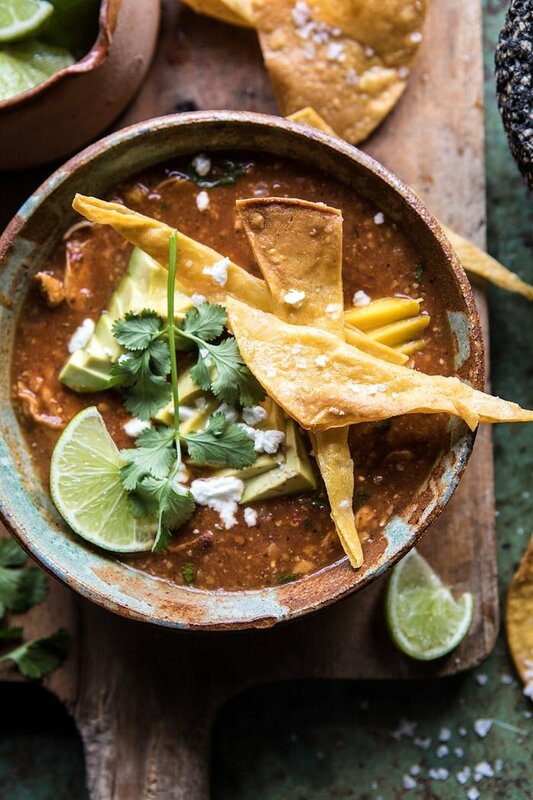 You all know how I love my toppings, and I did them up for this chili with some cilantro, lime, mango, avocado, homemade tortilla chips, and crumbled goat cheese. Trust me, this is your New Year’s recipe, or at least sometime in the next few weeks. Everyone you are serving to is going to love this recipe, and it’s the perfect warming chili to cozy up to after a day of playing in the snow. 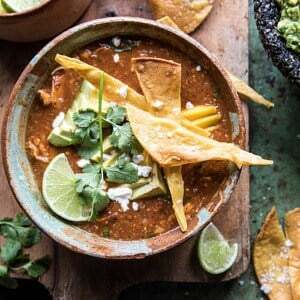 Basically a cross between tamales and chicken tortilla soup, an it is DELICIOUS! 1. In the bottom your crockpot, layer the onion and garlic. Add the chicken, ancho chili powder, cumin, oregano, salt, and pepper. Pour over the enchilada sauce and 4 cups broth. Add the apple cider vinegar, chipotle chilies, and cornmeal. Cover and cook on low for 6-7 hours or on high for 4-6 hours. Shred the chicken using two forks. Taste and add salt if needed. 2. In a small bowl, combine the mango, lime juice, and lime zest, and cilantro. 3. 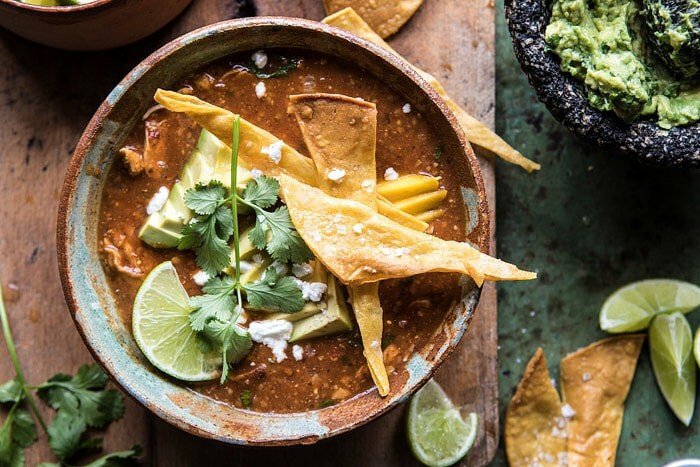 Ladle the soup into bowls and top with mango, tortilla chips, avocado, and cheese. Garnish with cilantro and limes. Enjoy! 1. In the bowl of your instant pot, layer the onion and garlic. Add the chicken, ancho chili powder, cumin, oregano, salt, and pepper. Pour over the enchilada sauce and 4 cups broth. Add the apple cider vinegar, chipotle chilies, and cornmeal. Cover and cook on high pressure/manual for 20-30 minutes. 2. Once done cooking, use the natural or quick release function and release the steam. Shred the chicken using two forks. Taste and add salt if needed. Finish as directed above. Thank you Liz! I hope your Christmas was amazing as well! Hi -; i don’t see instant pot instructions for this recipe? Oh I wish I had some right now. I need to run to the grocery store and get some things. Haha I hope you love this Nancy! Thank you! I’m going to try this – but vegetarianize it! Looks delicious, I’ll just replace chicken with beans and maybe some mushrooms! Sounds amazing! Let me know how it turns out for you Lori! Thanks! I love this recipe. Can’t wait to make it when I get home. Also, a great way to use up several spices in the cabinet. Glad you had a wonderful Christmas. I wish you would bring back the print button on the mobil Website. I really like your creative cooking but lately (i think since your website update and gone print button) i am skipping your recipes for the simple fact that i don’t like to have my mobil laying around while i am cooking and it is too time-consuming to write your recipe out by hand. This looks absolutely incredible! I’m curious what other dishes you’d serve with this for NYE? 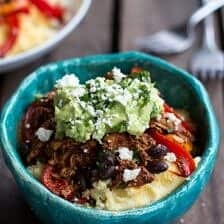 I love this slow cooker tamale chili and think I’ll have to make it for my family sometime this week! But I’m not the biggest fan of mango. Do you have any recommendations as to what I can use instead? Or should I just not worry about the mango on top? Haha would pomegranate seeds be good? I’m looking forward to more winter recipes! (And Thursday’s tacos 😉). I made the chipotle chicken tamale chili for dinner tonight, super flavor. The goat cheese was a great topping, the cilantro/lime mixture not so much – made it too sour. I didn’t have a ripe mango or avocado, didn’t use either of them. For the next bowl I plan to use goat cheese and cilantro with no lime and will try to save a bowl until a mango & avocado ripen. Hi Keith! I am glad you liked this dish! Sorry the cilantro lime topping did not work for you, but I hope you enjoy this more the next time you make it! Thank you! Insta pot awesomeness. Love cozy meals. Like this. Thank you Naomi! I am so glad you like this! Definitely my kind of chili! And I’m so envious, a white Christmas is something I’ve always wanted, and hope to have one like that someday! I hope you do one day! Really glad you like this, thanks Matt!! This recipe screams “yum”! I’ll definitely have to try it. LOVE the cornmeal in here! Did tge stove top instructions get posted? I didn’t see them. I am looking foward to trying this recipe, but don’t use a crokpot or instapot. 1Saute the onion the onion and garlic with 2 tablespoons olive oil in a large soup pot over medium heat until fragrant.. Add the chicken, ancho chili powder, cumin, oregano, salt, and pepper. Pour over the enchilada sauce and 4 cups broth. Add the apple cider vinegar, chipotle chilies, and cornmeal. Bring to a boil and simmer for 20-25 minutes or until the chicken is cooked through. 2. Shred the chicken using two forks. Taste and add salt if needed. Finish as directed. Love that this is a slow cooker recipe Tieghan! LOVE Bob’s products! Hope you had an awesome Christmas! Same! Thank you Mary Ann! I really want to try this but I’m kind of afraid. I do like tamales and I do like chicken but I live in a rural part of Arkansas and don’t know that I can find ancho chili powder or Mexican oregano. 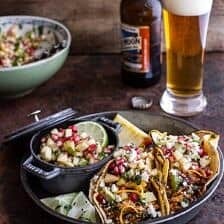 Where do you find these unique ingredients? I can order them on Amazon for about 10 dollars each, so I really want to make sure this is a yummy recipe. 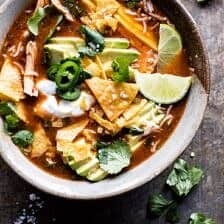 It looks beautiful and I love chili and soup that I can freeze that is hearty and comforting and this one looks like a winner. I was able to find ancho chili powder but used regular oregano, amazing recipe!! First of all, I don’t know how you manage to consistently hit all the right tastebuds in our household — but you do! I can always count on your recipes to be spot on. Thank you for that. As for this soup — delicious! And that comes from a Texan household that can feel rather territorial around anything that ventures into the tortilla/tamale/Tex-Mex realm. Always thrilled to see slow cooker meals, too — you can’t beat them for wintertime aromatherapy. Wishing you and yours the happiest of new years! My mouth is watering looking at that soup! This is a keeper for my family. Made it in the crockpot with 2 bone-in chicken breasts and swapped the spices for a generous portion of “taco seasoning.” (I like the Spice Island brand from Costco). Even my “picky” eater ate it. We told her it was a creamy chicken soup. Haha. So happy to hear that! Thank you Brenda! Just found your site this year and following on Instagram. Love the flavors of your recipes and just tried this one tonight. Another winner! 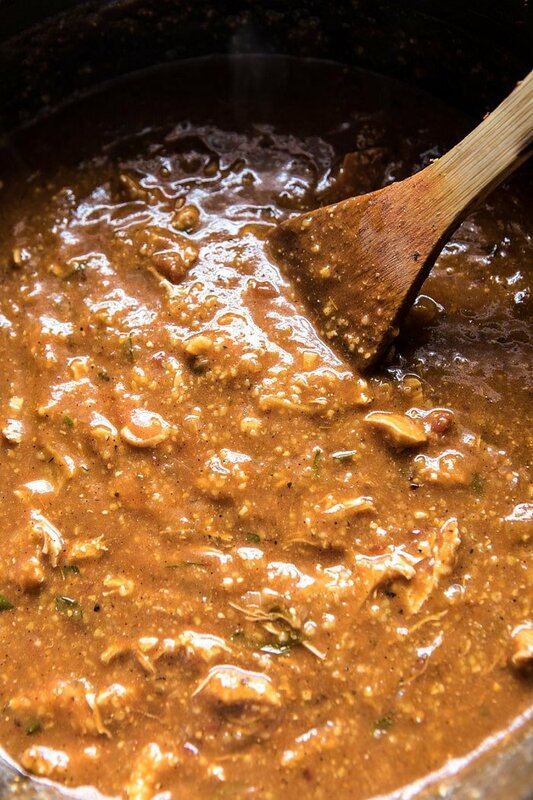 Full of smoky flavor and compares favorably to other chicken or turkey chili recipes I’ve tried. Looking forward to seeing what you have in store for 2018. I am so glad you enjoyed this and other recipes of mine! Thank you and Happy New Year! Finally worked up the courage to use my instant pot tonight, and made this recipe. About 5 minutes after starting, I received a “burn” message on the IP 🙁 seems like even though I added the cornmeal on top some of it sank and stuck to the bottom. I ended up cooking it on the stove top, but am disappointed I couldn’t use the IP. HI Alexis, I am so sorry for the trouble. I honestly have no idea what could have happened. What brand instant pot are you using? Again, so sorry for the trouble. I had the exact same thing! I have an Instant Pot DUO and the manual says it’s from “starch deposits” which may be the cornmeal. I just threw mine on slow cook to finish the meal. Totally delicious, as usual! Everyone went back for seconds. More Instant Pot recipes, please! I’m getting ready to go back to work after mat leave and want to have my arsenal of IP recipes FULL. Great! I am glad everyone enjoyed this! Thank you Alison! This was a huge hit at my house. I had all the fixings and my kids loved personalizing their chili. I also had leftover rice and we each added a scoop to our bowls. Will be making again for sure! I am so happy you and your kids loved this recipes Kellee! Thanks so much! I LOVE your Mexican recipes Tieghan! 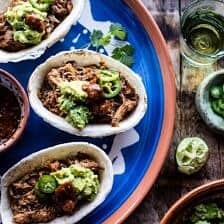 I made your Carnitas Bar recipe for New Years Eve for 14 people but subbed the pork from your Tamale Bowl recipe from your cookbook (which my husband says is the best dish I’ve ever made!) – my whole family was very impressed! 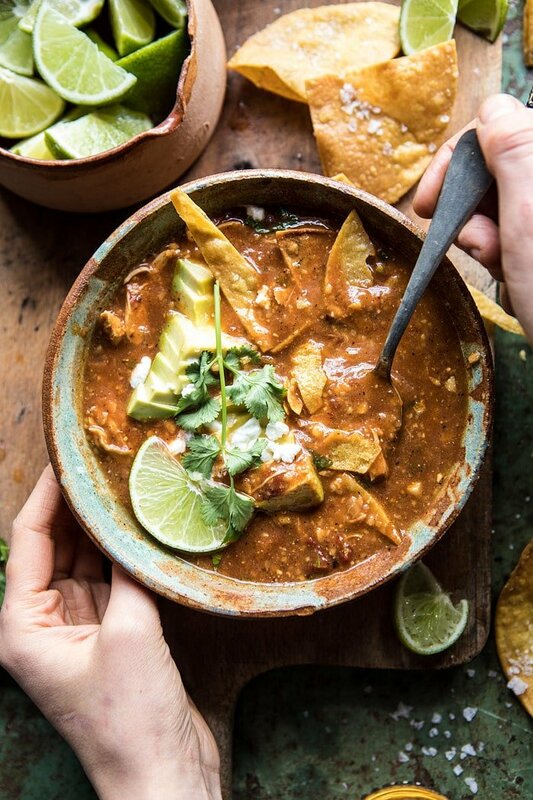 I just have one question for you – how do you get your tortilla chips to look so crispy and delicious?! We love your recipes! A co-worker made this and sent me the link and she said it was wonderful! I tried to put into My Fitness Pal to calculate nutrition, but it says no recipe found with the URL link. Has anyone else reported having an issue with importing your recipes into MFP? Just curious. This was EXCELLENT without the salsa and goat cheese. Could only find ground Pasilla Chile. 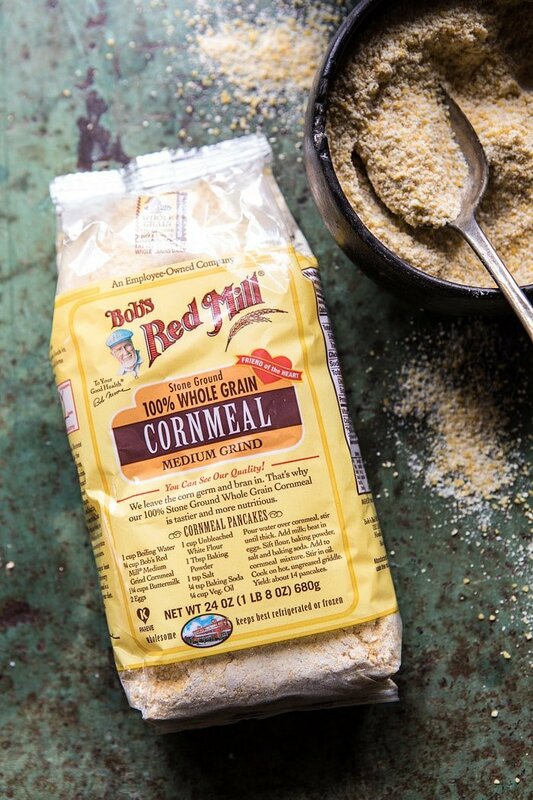 I used Bob`s Red Mill polenta grits since I had that on hand. Anticipating the leftovers today. Thanks for a great recipe. I am really glad you enjoyed this! Thank you CJ!! Really enjoyed this! Also found the leftovers to be even better. My coworkers were jealous of my lunch box for sure! Ah that is so great! Thank you Christiane, I am so glad you enjoyed this! Thank you so much Megan! I am so glad you like this! This was fantastic with Instant Pot instructions. I make my own enchilada sauce so sauted the onions, garlic and spiced from both recipes first, finished the enchilada sauce and then added your ingredients before making the MAGIC. Wonderful layers of flavour. Cilantro, avocado and lime juice were my garnishes. This will now be a household staple. I made a couple additions/changes but it is still good. Really spicy so I added corn and olives. Eliminated the chips and added shredded cheese. Maybe lime juice would tone it down but I didn’t have any. Maybe I’ll get some tomorrow. Thank you!! Would you do a recipe for making corn tortillas? Great chili for this weather and definitely a keeper! I am absolutely going to make this! Do you think I could use masa harina instead of the cornmeal? I’m also going to use cotija cheese instead of goat cheese. I can’t wait! Delicious!! Made this tonight and the flavors/spices were spot on! I made this in my instant pot and my *only* suggestion is to mix the cornmeal with the broth beforehand. I just poured it on top and had some chunky pieces or gelatinous discs that didn’t fully mix in. Otherwise- a total hit. Thank you! So glad you enjoyed this! Thank you Dee! I’m obsessed with this soup! I’ve made it three times and recently bought an Instant Pot so I can make it more often! I crave it. Thanks! Hi there: this meal is so delicious! When I make it in the crockpot it comes out perfectly. But when I make it in the Instant Pot the burn feature happens. I followed the recipe super carefully. Advice? I first tried 30 minutes. Then the next time 20. Perhaps stir it so broth reaches the bottom more efficiently? I’m new to the InstantPot and want to love it. Help! Looks great! Do you think I could prep it a week ahead of time & freeze it till I’m ready to throw it in the crockpot? The family loved this recipe. It was a cross between tamales and enchiladas. I used the amount of broth on the higher end and had to omit the chilis because of the kids. They weren’t crazy about the lime but everyone liked the mango and cilantro on top. I am so glad everyone loved this recipe, Jennifer! Thank you so much! This was really easy and so delicious considering how few ingredients were in it. I made my own enchilada sauce and then tossed everything in the slow cooker. The chicken shredded nicely and the broth was very flavorful. The chipotles in adobo added a nice smokiness. I would make it again.